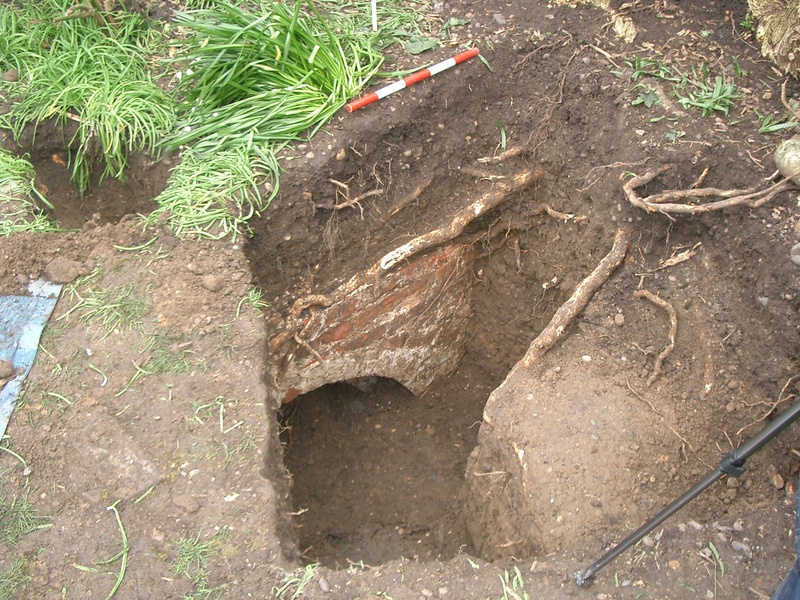 September’s picture of the month is the discovery of Blendon Hall’s cellar. The picture celebrates the transition of the ‘Blendon Project’ from a historical research project to a historical research and archaeological project. It dates from March 2004. 2004: It’s exactly seventy years since the Georgian Hall at Blendon has been demolished. In 1934, ‘Saunders and Sons’ dump all the physical remains of the demolished Hall on Plumstead Marshes. D.C. Bowyer and Sons sell off a few final ‘fixtures and fittings’ in the preceding weeks. They now eagerly anticipate further lucrative development on the newly vacant land. New homes….New lives….New starts. People embrace change. But war comes. People seek refuge – a few very grateful for underground shelter in the old Blendon cellars. Time moves on. Peace brings better times. Fear of war fades. Shelters are closed. Entrances blocked. Children’s safety is paramount. Underground shelters become hazards. Original owners of new estate houses pass on. Memories are lost. Photos destroyed. At the end of the century, interest in Blendon’s history is rekindled. Finds are documented, memories jolted, documents shared. Talks are held. Archives consulted. A book is published. Much that was unknown and lost is found or recalled. Then a chance remark. On the Estate in Beechway, a much-loved cat dies. A deep hole is dug. Digging stops as soil starts to run away further into the ground. Surprise and concern. The cat is buried elsewhere. A few weeks later, four people stand round the spot where the cat was originally to be buried: two historical researchers, a professional archaeologist and the householder who owned the cat. Then he’s horizontal on the ground as his shovel hits a void underground. This is the spot. Four tonnes removed and sieved later. This is what we found. The cellar intact, a connecting arch and even a clip to hold wires for illumination.